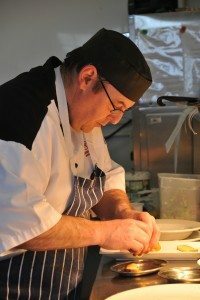 Chef Phil Thomas from Cornwall, has had a career that has gone full circle, starting with school work experience at Rosewarne Manor, near Hayle, the same hotel where he is now head chef. After work experience, Phil was offered an apprenticeship at Rosewarne Manor, 25 years ago. He went on to spent eight years at The Garrack Hotel in St.Ives, achieving various accolades, including 2 AA Rosettes. 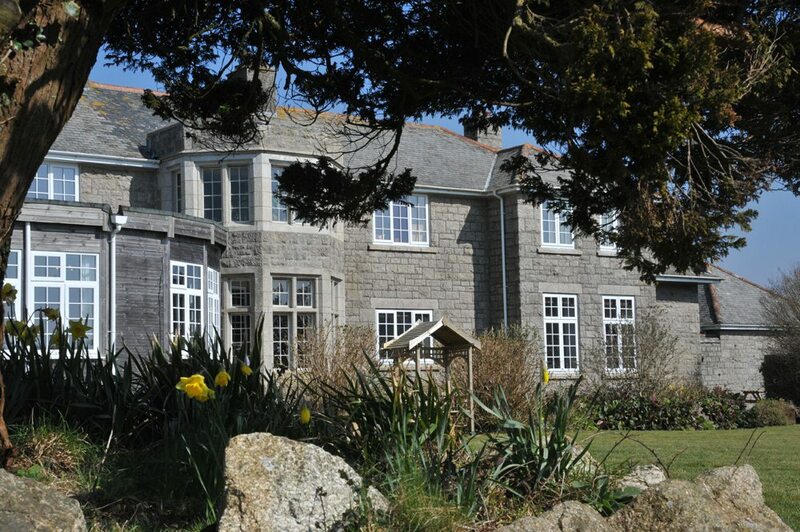 Following this, he moved to Tregenna Castle Hotel and Resort to experience a busy function operation. After 14 months in the job, he was approached by the new owner of Rosewarne Manor to assist with the reopening after it had been closed for several years. He has been with the successful restaurant since its reopening in 2007. Phil and the team at Rosewarne work closely with local butchers, farms and suppliers to obtain the best quality locally produced ingredients wherever possible. Phil and the team at Rosewarne are keen advocates of training in the workplace and have worked with Truro College, Cornwall College and the Jamie Oliver Foundation 15. Now focusing on fine dining at the venue, Rosewarne Manor was winner of 2 AA Rosettes for fine dining for the last three years, Gold Taste of The West awards for the last three years and a Platinum C.H.E.F.s awards for food safety and local sourcing. 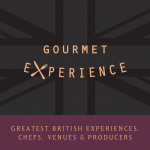 Upmarket restaurant, wedding venue and accommodation, offering evenings devoted to tasting menus. Dry the orange peel and zest for the garnish in the bottom of an oven at its lowest temperature until dry and crisp. Finely shred the confit duck leg meat and mix in the mustard. Form the mixture into small bonbons and coat in our, egg and breadcrumbs. Set aside until needed. Trim the duck breast of any sinew and score the skin with a sharp knife. Place the duck breast skin-side down in a hot, ovenproof frying pan over a medium-high heat. Sear until the skin is golden brown and the fat has rendered down. Turn and seal the flesh until golden brown. Sprinkle the pears with the sugar and season. Add to the pan with the duck breast and lightly colour. Drain the duck fat from the pan and reserve. Roast the duck breast and pear in a pre- heated oven at 220°C for eight minutes. While the duck is cooking, heat a medium pan with a little of the rendered duck fat and add the red cabbage and garlic purée. Stir- fry the cabbage for five minutes then add the red wine vinegar and sultanas. Reduce the heat and simmer until the excess liquid has evaporated. Remove the cabbage from the heat and keep warm. Deep-fry the duck leg bonbons in vegetable oil until golden brown and crispy; keep warm. Remove the duck breast from the oven and rest for eight minutes. Deglaze the pan used to cook the duck with the chicken stock. Add the double cream and red currant jelly and reduce to desired consistency. Blend the smoked sea salt, dried orange zest and peel, and juniper berries to a fine powder using a pestle and mortar. 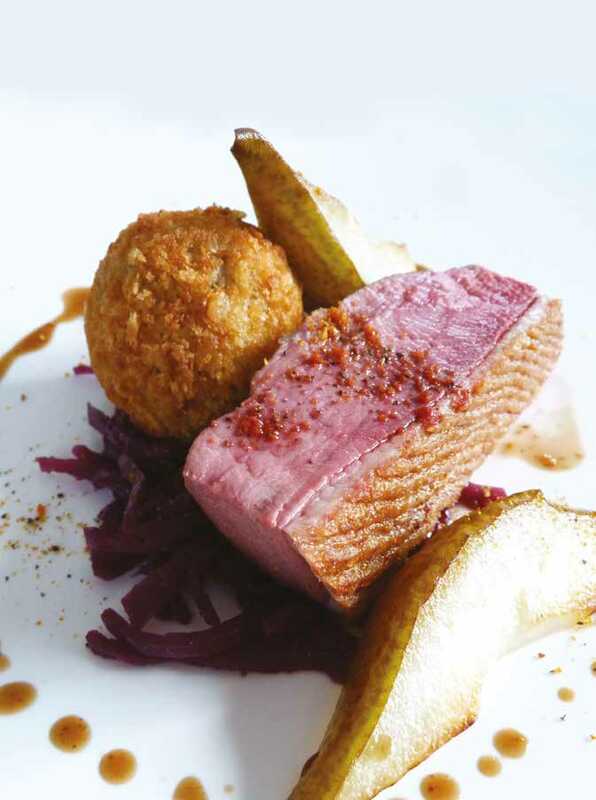 To serve, put the cabbage in the centre of the plate with the sliced duck breast on top. Arrange the pear to one side, allowing two- quarters per person. Finally add the duck leg bonbon. Finish with a generous pinch of the orange and juniper salt and duck sauce.